July 21, 2016, 11:06 AM · With the new school year just weeks away, violin students around the country will be heading back to class. For many, that's the time that they go looking for new instruments, or even just a tune-up or rehair for their current setup. To help connect violin students with luthiers near them, we have reintroduced our Violinist.com Luthier Directory. You can find it linked under "Directories" on the top of all Violinist.com, or click directly to it via www.violinist.com/directory. 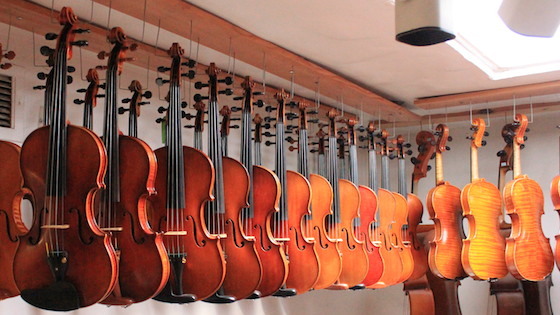 We would like to invite Violinist.com readers who own violin shops to join the Luthier Directory and start connecting with the thousands of student and professional violinists who read Violinist.com every day. You can set up your page via our sign-up form. Your Violinist.com Luthier Directory listing remains under your control — you can add inventory, descriptions, customer reviews, and embed all the photos and videos you'd like. You can update the page at your convenience and promote your special Violinist.com URL to your customers. Participation in the directory requires a one-time $200 fee, which you can pay online when creating your listing. It's a great value that allows you to connect with a vibrant community of violinists while also supporting the original and insightful content we create for the front page of Violinist.com. Whether you are a luthier or a violinist looking for a luthier, we hope that you will use our new Violinist.com Luthier Directory! July 22, 2016 at 08:00 PM · There is a good luthier in Roanoke, Virginia. His name is Patrick Toole. You can find him on Facebook. He has done repairs for me, installed gear pegs on a viola, fitted a new bridge to my daughter's violin, closed a loose seam on that violin, sound post adjustments, etc. And he makes beautiful instruments that are very good value. His studio is convenient to downtown Roanoke.